The West Coast Wilderness Railway carves its way through thick rainforest on the west coast of Tasmania and takes you to wild locations otherwise inaccessible. 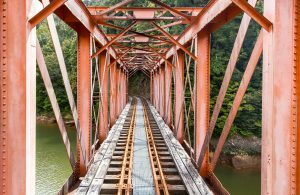 The train runs a 35-kilometre track between the towns of Queenstown and Strahan, and is of important historical significance for the area. In fact, 3 of the 5 original locomotives used on this fascinating 1897-built railway are still in operation. A fourth locomotive was scrapped while the fifth sits in a museum in Hobart. The ride takes you through gorges, up steep grades, past historical markers and to incredible wilderness vantage points. And the train stops for you to enjoy each of these locations. You can board the train for a full- or half-day itinerary in either Queenstown or Strahan, and you have your choice of train cars. 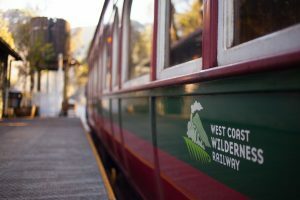 The Heritage Carriage offers drinks and snacks for purchase at stations along the ride while the Wilderness Carriage is all inclusive with catering and a complimentary glass of sparkling wine. 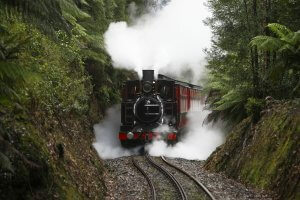 You have two choices when boarding the West Coast Wilderness Railway -- Queenstown and Strahan. 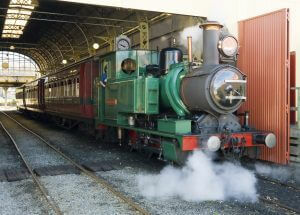 After all, the train was originally built to take minerals from Queenstown to the coastal town of Strahan for export. Queenstown is a bit inland and an easier drive. The historic mining town sits 260 kilometres from Hobart which would take you about 3 hours and 42 minutes to drive. The drive from Launceston is about the same as the inland city sits 244 kilometres to the northeast. Devonport, the home of the Spirit of Tasmania ferry to the mainland, sits hundred 96 kilometres to the north and that drive would take you about 2.5 hours. You can also choose to drive around Queenstown to the picturesque, coastal town of Strahan. From Hobart, the drive will take you 4.5 hours. Launceston sits about 3 hours and 40 minutes away and Devonport gets you there quickest at nearly 3 hours. There's absolutely no other landscape on earth quite like Queenstown. In the 1800's, this former mining town was stripped of all of its trees, bushes and soils, as copper smelting sent land-killing sulfur into the air. What's left is beautiful but a stark reminder of man's greed. The mining boom drew rugged men from all over the world looking to make it big at the expense of the local, natural environment. It was this mining boom that led to the construction of the railway you get to enjoy today. Most of the men descending on Queenstown left empty-handed, but Bowes Kelly was not one of them. Kelly had one advantage over everybody else -- he was already wealthy. Striking it big by founding the mining company that would eventually become BHP, Kelly turned to his new venture in Queenstown after receiving a soil sample from the area which was rich in copper. He arrived in the mining town in the 1800's and bought up all the land he could. The mining was far from easy. It began to destroy the land around Queenstown and the situation became even more difficult when they ran up against one big problem -- how would they export their minerals? Kelly was committed to the idea that a railway could be cut through the incredibly dense forest on the way to the coastal town of Strahan for export. It turns out that he was right. Building the railway was incredibly challenging. At one point, Kelly was employing over 2,000 axemen and not one of them had an easy life. The timber they cut fed the copper smelting in Queenstown, was used to build the track and was turned into boats for shipping at the town of Strahan. But it was not used for firewood. 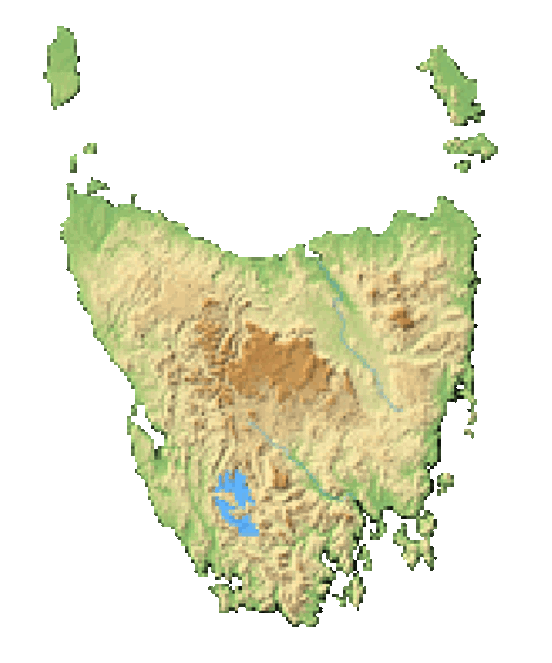 Receiving over a meter and a half of rain per year, western Tasmania is one of the wettest places on planet Earth. This means the axemen could not use their own felled timber to keep themselves warm at night. Instead, at the end of a hard day's work, they would crawl back into a hole in the ground with a canvas roof. And the hole would usually be filled with water. Image thanks to Jason Futrill. In fact, it was so wet during the construction of this railway that many construction workers cut holes in the bottom of their boots to let out water. But these holes also let the leeches in. It was through this hardship that the intrepid railway was born in 1897 using incredible technology to climb steep grades. A third rail was installed on the track that featured teeth which would interlock with a gear on the train to help it ascend steep grades. That technology is still used today. The railway was the only way in and out of Queenstown for a long period of time. Operation costs became unbearable as roads were cut to these west coast towns. Eventually, trucks became the preferred means of transportation and the railway was shut down in the late 1960's. A revival effort in the 1990's brought this railway back to life for your enjoyment. It took 3 years to become operational again and now you can board this train to experience the wild terrain and history of Tasmania's west coast. There is no mistaking Queenstown's moonscape. This ethereal landscape was created during the mining boom of the 1800's when copper smelting stripped the land of trees, bushes and topsoil. What's left is a colorful man-made landscape that is both beautiful and striking. Once the train departs Queenstown, it starts to enter cool temperate rain forests. The vegetation here is so thick that it makes you wonder why anybody would venture out to Queenstown before the construction of the railway in the 1890's. The train climbs through gorges and up steep grades, past historical markers and beautiful vantage points. Image thanks toHype TV. Eventually, the train will arrive on the west coast and the town of Strahan. This tiny little port town is important in your exploration of Tasmania. You can board a boat here to explore the Gordon River, or you can get more adventurous by jumping on a boat down to Port Davey and the remote reaches of Southwest National Park. The weather in both Queenstown and Strahan is incredibly temperate. You'll experience very pleasant temperatures during the day and nice cool nights that are perfect for sleeping. But it rains about half the days of the year on the west coast to the tune of one and a half metres of rainfall annually. Always prepare with a little bit of rain gear.